Vietnamese lemongrass chicken with chilli Cook like a pro! 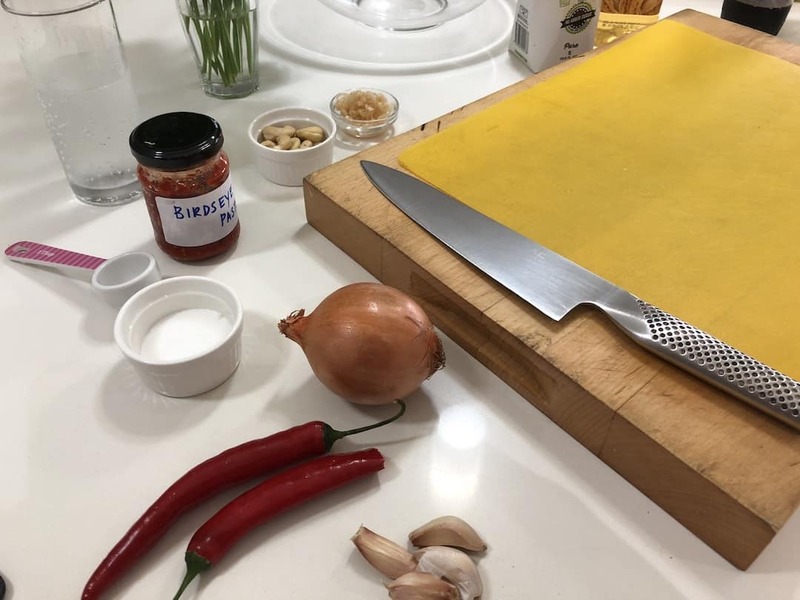 I recently participated in a cooking class at the Nha Trang Cooking School. Here’s my version of one of the dishes we made. **Note: You can use chicken breast for this but using one of the tougher cuts, like drumsticks or thighs on the bone, provides additional flavour and adds a rustic feel to the dish. This mirrors the environment in which I cooked it, so it rings true for me making it this way. With Asian cooking, where everything seems to happen quickly and all at once, I prefer to prepare all of the ingredients at the beginning. That way you aren’t chopping whilst something else is burning! Chop the chillies up finely, removing the seeds. Alternatively, if you prefer, grind it into a paste using a mortar and pestle. Note: the use of chilli in this dish is totally variable. Add as much, or as little as you wish. For a little extra heat, add in the seeds, or add a dash of birdseye chilli paste. If using fresh lemongrass, also chop or mince finely. do the same with the garlic cloves. Take the chicken drumsticks (or whatever you have decided to use) and put some cuts into the flesh, all the way around. This will assist later when marinating the chicken. Pour a tablespoon of oil into a wok and when hot, cook half of the chillies and half the garlic until lightly coloured. Do not overcook this as the garlic will taste bitter and the chilli will lose a lot of its fresh flavour. Put the chicken drumsticks into a large bowl, add the fish sauce and sugar, along with the cooked chilli and garlic. Mix it all around, getting as much of that mixture into the crevices of the chicken. Cover with plastic wrap and place in the fridge for at least 30 minutes. Leaving it longer, if you are able, will only enhance the flavour. Take the chicken out of the fridge just prior to cooking it. Heat another tablespoon of oil in the wok and add the remaining chillies and garlic, again making sure you don’t burn it. Add the chicken pieces and move them all around, covering in the garlic and chilli and getting some light colour on them. Add the onions and allow to soften slightly before adding all the lemongrass. Mix around once more to cover all the chicken legs in the mixture. Move the chicken and mixture to a pot. Add the coconut juice, reduce the heat, cover and leave to cook for about 30 minutes. Regularly move the chicken around the pot. At this stage, take the lid off, turn up the heat and reduce the sauce down so that it will just coat the chicken. Note – this time of cooking is only for chicken on the bone, or thigh fillets. If you are using chicken breast, you will only need to cook for 5-10 minutes, until just cooked through. Add some additional chilli if required, some ground peanuts, coriander or parsley, a good splash of lime and some rice. For more great recipes based on our travels head over to our Cook with Me page.